After finishing his high school career at Wooster as a first-team offensive lineman in football, as well as a standout on the field in track, Drew Gerber went on to become one of the top blockers in the storied history of Youngstown State football, and during one of the Penguins’ top periods. At Wooster, Gerber won three letters with the football team and three more in track. In addition to being a sophomore contributor on Wooster’s 1986 playoff team that reached the state football Final Four, he lettered three times in track as a thrower. 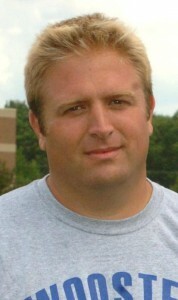 Gerber won a district discus title and was second in both the discus and shot put at the Cardinal Conference meet. When the Generals joined the Federal League, he was runner-up in the discus at the FL meet and fourth in the shot. At the district in which he won the discus crown, he was fifth in the shot, and then went on to place fifth in the discus at regionals. On the gridiron, the honors rolled in for the mobile lineman, as he was a two-time first-team All-Daily Record pick, and first-team All-Federal League as a senior. Jim Tressel offered him a full-ride scholarship to YSU, where Gerber, now a guard, started four years and 57 consecutive contests for the Penguins. While playing, YSU captured national championships in 1991 and 1993 and finished second in 1992. Following his senior season, the captain was named a first-team All-American on both The Associated Press and Kodak teams. Gerber was inducted into the Youngstown State University Hall of Fame in 2003, and in 2007 was voted one of the top 25 players in Stambaugh Stadium history. He would earn a degree in education and is now teaching and coaching in the Wooster City Schools district. In 2009, he was inducted into Wooster High’s All-Sports Hall Fame.